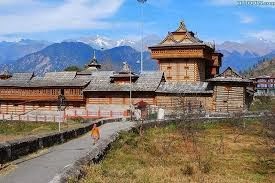 Shri Bhima Kali Temple is a temple at Sarahan in Himachal Pradesh in India, dedicated to the mother goddess Bhimakali, presiding deity of the rulers of former Bushahr State. The temple is situated about 180 km from Shimla and is one of 51 Shakti Peethass. The town Sarahan is known as the gate way of Kinnaur. Down below at a distance of 7 km from Sarahan is the River Satluj. Sarahan is identified with the then Sonitpur mentioned in Puranas. According to a legend, the manifestation of the goddess is reported to the Daksha-Yajna incident when the ear of the Sati fell at this place and became a place of worship as a Pitha - Sthan. Presently in the form of a virgin the icon of this eternal goddess is consecrated at the top storey of the new building. Below that storey the goddess as Parvati, the daughter of Himalaya is enshrined as a divine consort of Lord Siva. The temple complex has another three temples dedicated to Lord Raghunathji, Narsinghji and Patal Bhairva Ji (Lankra Veer) - the guardian deity.